At the core of JTLA’s mission is commitment to arts and community. We are dedicated to providing arts education to members of our community in an effort to empower individuals to express themselves through creative means. A little instruction can go a long way to promoting self-confidence. The Artist-in-Schools program brings talented local artists into our schools to work on special projects with students. 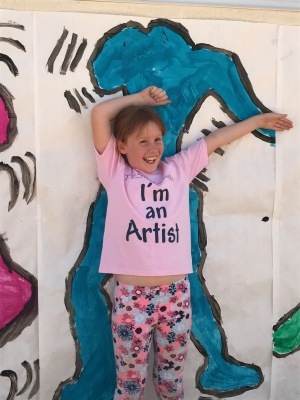 ​In May 2018, artists Heather Sprague and Rhonda Coleman worked with 200+ students at Landers Elementary and Twentynine Palms Elementary to create temporary, life-size silhouette murals influenced by the artwork of Keith Haring. Kids had the opportunity to learn about color, shape, line, scale, and movement and explore ideas of graffiti, street art, and portraiture. JTLA hosts a variety of independent workshops that provide instruction from professional artists and the necessary supplies. 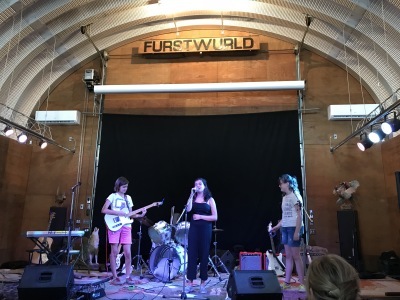 Pop duo, Azaila Snail and Dan West, taught a songwriting workshop for kids at Furstworld. Youngster bands, P22's and Frieda's Roses, collaborated with local kids to write and perform songs. Joshua Tree Living Arts was proud to present The Garifuna Collective featuring Umalali at the Joshua Tree Music Festival this May 2018. The workshop provides a greater understanding of and appreciation for the work of the presented artists/ensembles.The showcased group, Umalali—meaning ‘voice’, is a moving ensemble that captures the beauty and power of Garifuna female expression. In concert, The Garifuna Collective combines storytelling with music, dance, and traditional costume. 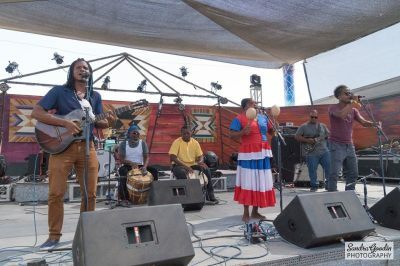 Involving singers from the Garifuna communities of Belize, Honduras, and Guatemala, Umalali and the Collective aim to maintain the threatened music of the Garifuna community, and allow their traditions to thrive in a modern context. Big thanks to our partners; JTMF, Southern Exposure-Performing Arts of Latin America, and Mid Atlantic Arts Foundation!